I've wanted to switch to Metric for years. It's clearly superior to Imperial: You try quickly calculating the midpoint of 15 13/16" versus the midpoint of 402mm. Or drill a hole with a 7/32" bit and discover it's a smidgen too small: Do you need the 13/64" or the 15/64"? I've also been suffering with a crappy Titan digital caliper for years. It snags on the foam lining when you pull it out of the case; it spontaneously re-zeroes itself mid-reading; changing the battery is a chore and always needs to be done at an inconvenient time. So I always said one day I'd treat myself to one of the nicer $100 dial calipers. I could do without the distractingly chunky capital "F"—I dislike being distracted by branding when I'm trying to focus on using a tool—but I guess these guys are trying to leave their mark, and I'm willing to roll the dice on them. This is the first Kickstarter I've actually backed rather than just writing about it. If they hit their target, I'll be the owner of a FLINT caliper around August of this year. I'm really looking forward to switching to Metric, as I've always admired the precision possessed by those who use it. Did I ever tell you about the time I lost a bar fight in Germany? This guy beat me to within 25.4 millimeters of my life. As far as i know this even goes against the terms and conditions of kickstarter. This campaign is really only just about making some quick money and not at all about kickstarting a project. @Anonymous I'm sorry you think this is a rip-off campaign. We sincerely worked hard to create something that we thought was great. Our intent has been well-meaning and genuine. We have put countless hours into designing and developing our offering. If you visit our campaign, I think you'll find that we have been clear and forthright about the different components that make up our kit, and what's gone into each of them. To be clear... 'quick money'? There's nothing quick about the last 12 months, and the countless hours that have gone into this project- hours of brainstorming, design, CAD, refinement, updates, material selection, zipper selection, durometer testing, prototyping, graphic design... not to mention the Kickstarter effort itself... shooting a video, getting good photos, recording a voice-over 100 damn times (one of the most maddening things in the world) etc. The list of time and efforts goes on and on. We won't make that time back on this project even if we funded 2 times over. But it's an effort that's been fun and rewarding. We're designers and we love creating things, and we may get a chance to put our work out here without a client calling the shots... That's a fun, exciting thing, and that's all this is about. Hit us up at info@flintstudiotools.com and we'll send you a complimentary rule if we fund. 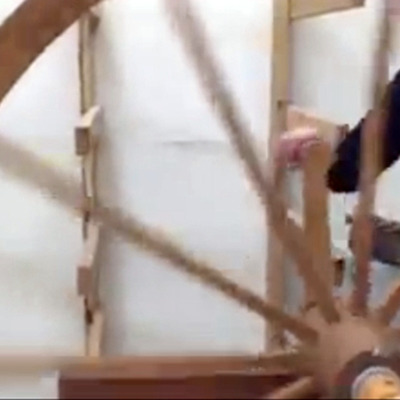 You spent 12 months re-inventing the wheel? Who the hell gave you a license to design? All I see you do in this whole comment section is act defensive. Good luck to you. Thanks for the comments, everyone, even the anonymous ones! This is a learning process and we appreciate all the feedback. At Flint, we designed everything featured in he Kickstarter package. The calipers are custom made for us with our aesthetic design though the mechanical components are sourced from a trusted partner. We went to the experts to help get those developed - people who live breathe and sleep calipers all day. It's a component of the kit we wanted to include that didn't make sense to develop entirely on our own, thought we’d love to do that in the future and this is a step in that process. This is something explicitly stated in the kickstarter video and FAQ sections, and is something we chose not to shy away from. The ruler has been entirely developed by us over the last 12 months. We’ve featured photos of the process on the kickstarter page. The case as well has been entirely developed by us. Photos of the process to show iterations of those designs, as well as the calipers are featured on the kickstarter page as well.. This has been also 12 month journey for us. All together they form the kit, which is the reason for kickstarter project. 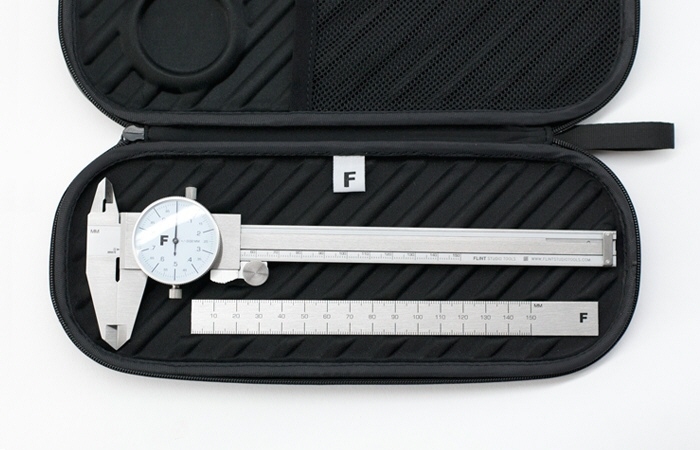 We wanted to create a better compact case for carrying calipers, a cleaner, more legible ruler, and a reliable caliper. That being said, if the caliper offering keeps you up at night, how about a ruler or tee shirt? We think they’re pretty cool. Same goes for scales. 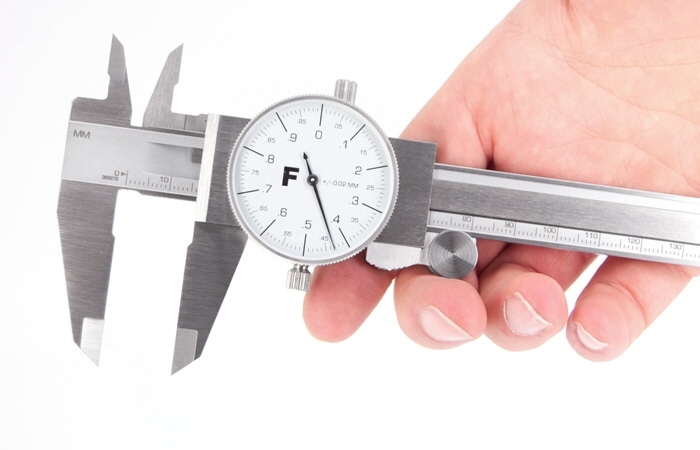 If you want a measuring tools that will last for a lifetime, but from a company that is in the businees of making quality measuring tools, not a "designer" company. I don't get it. I have been using Mitutoyo analog and digital calipers my whole life and have never had any problem reading from them. These guys are just talking BS, just take a look at the different "iterations" of the dial faces, almost all of them are ridiculous and unusable (why does one look like a compass dial?!?) and none of them are any improvement over the thousands of existing dial caliper faces that are already on market. @TP Why so mean spirited? To get to a design that looks and functions great, it takes a lot of iterations that may be terrible. It's exploratory and is a key part of the design process that should be embraced. Don't you agree? 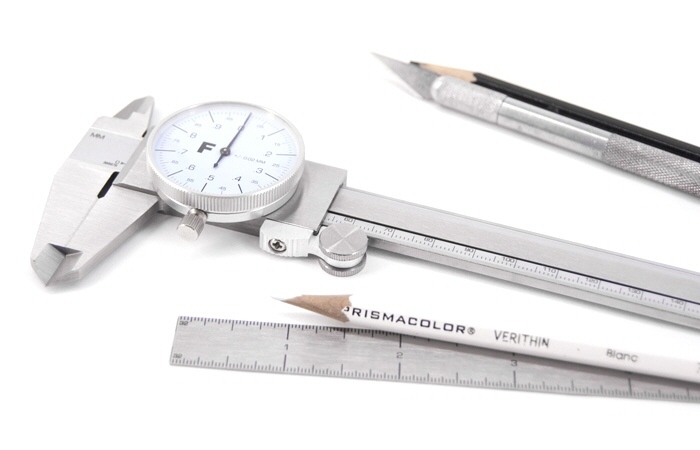 You can't get our measurement kit or caliper in their store- However, I didn't know that store existed. Our MOQ is 500 units and our cost per unit is more than the caliper you've shown by a significant percentage. Not to mention shipping and the inclusion of a fully custom case, and rule with their own sourcing, manufacturing and MOQs. Again, we're not in it for the money, and we've been forthright and clear about our intentions and process. Most importantly we're proud of our work. Jonas, if you would have visited our FAQ on our campaign, you would have saved even those short 5 minutes. You forgot to link to their Aliexpress store. Please Core... for the love of God... Stop. Posting. Such. Garbage. I have been a Core follower for about a decade and am appalled by the decline in quality content being posted over the past couple of years. I used to enjoy your content, now I just find myself getting frustrated avery time I visit your site. I can only imagine that this Kickstarter campaign was even written about because of the involvement of Spencer Nugent - a total has-been in the design community. 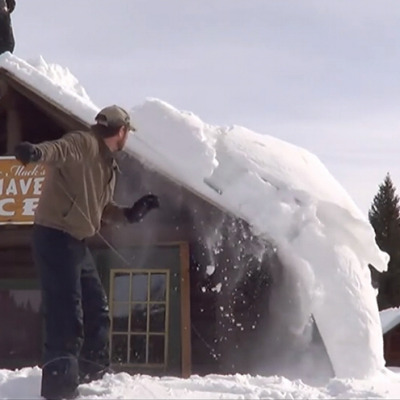 It's one of the least creative Kickstarter campaigns that I've ever seen. It seems like the creators learned about the possibility of private-labeling off the shelf goods and thought that it would be a good way to pull a fast one on the Kickstarter community. I'm happy to see that the campaign has stalled out at less than half of its goal. The Kickstarter community is learning to sniff out the BS and stay clear. I'll probably get a response from Jonny Jenson reiterating the fact that they actually busted their balls to "develop" these products... so to that I say: if you weren't designing the bezel, jaws, bar, scale, or any other metal component of your calipers, what on God's earth took you 12 months to develop? If you were doing this as a side project, then sure... 12 months of 4 hours a week sounds reasonable. But considering you sourced all of your hard goods and designed a soft goods case (or maybe sourced that too) for it, you can't go around claiming that you "sincerely worked hard to create something that we thought was great." Unless maybe the word "create" was supposed to say "repackage". This is the problem with Kickstarter. 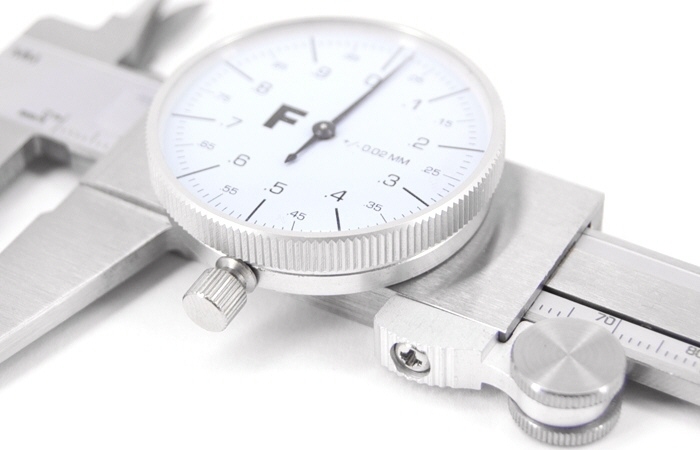 There is nothing about this dial caliper that isn't on every dial caliper and putting together a set doesn't make if fundworthy. Get a good 8" Mitutoyo or Starret digital caliper and you'll be good for decades. And, Core77, stop promoting this kink of nonsense. Outrageous! I'll stick to my Starrett. Sorry to pile on, but this is embarrassing. They've taken ordinary cheap calipers and put an "F" on the face and tripled the price -- core77 is blessing this as ID? 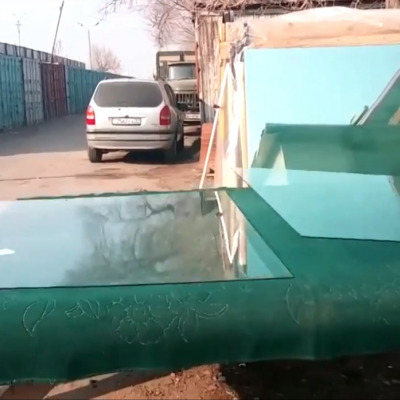 Some recent posts suggest you guys should get out more, or stay in and google more -- the "amazing" way glaziers cut glass (as all glaziers do)? snow-melting driveways are news? @Mark Thomas I'm sorry you feel this way. Your comment has been addressed in other posts on this comment board, but I want you to know our effort has been sincere. I think if you visit our campaign you'll see we have worked hard and honestly to create something we genuinely think is worthwhile. You're of course free to disagree with that, but we're proud of what we've done. Hit us up at info@flintstudiotools.com and we'll send you a rule if we fund. The content has gone to the absolute dogs in the last while. Nearly as bad as Yanko. Imperial calipers are in mils .001". So yes, as Paul pointed out, numbers are numbers. This is almost as bad as those painted axes. I didn't even watch the video. C'mon core77, lets put our BS filter on. Exactly this. Obtaining high quality (or above that, even!) measuring tools is not problem...hasn't been for many years. This is some "life funding" BS, these are totally off the shelf cheapish calipers with there logo on them. Didn't even changed the dial face just plastered the "F" logo on the existing one. Probably the same with the ruler being bought and plastering that "F" logo on it. There is a slim chance the designed the EVA case but I would say not likely. This is totally aimed at ID students that don't know better but Core77 you do know better, this is some BS to land on the front page of CORE 77. Oh, no--is this the guy from the bar in Germany? @Anonymous I think if you visit our campaign most of your questions will be clearly addressed. Also, 'life funding'... if we wanted a quick buck we'd have stuck with cnc'd pens, a wallet, or iPhone peripheral, don't you think? Hit me up at info@flintstudiotools.com and I'll send you a completely custom, every detail designed by us, rule... If we fund. You can use it as a door-stop of something. Check out the existing designs. Can you do better?